Playdead takes gamers on yet another captivating journey into the unknown with Inside. From the creators of Limbo comes Inside, an enigmatic experience bent on keeping the player in constant suspense as he or she attempts to solve the lingering question of who or what is “inside”. Players begin their journey as a young nameless child on the run as armed men and hunting dogs relentlessly track him through the woods, a farm and a dam. In his efforts to escape his pursuers, the child finds himself among the rooftops of a decaying city. Below, hundreds of people are mindlessly wandering into an ominous structure under the persistent watch of robots and black-clad men, women and children. An unfortunate misstep thrusts the child into a group of humans below, forcing him to comply with their surveyors and venture into the massive facility. Beyond the gate lies an extensive laboratory and testing center, populated with robots, imprisoned humans and unfinished test subjects. Presumably driven by his own curiosity, the child embarks on an extensive quest to discover what lies within the massive near-impossible structure, traversing through abandoned research stations, storage areas, a submerged ship, mining areas and a weapons-testing facility before coming to terms with the horrors that truly lie inside. 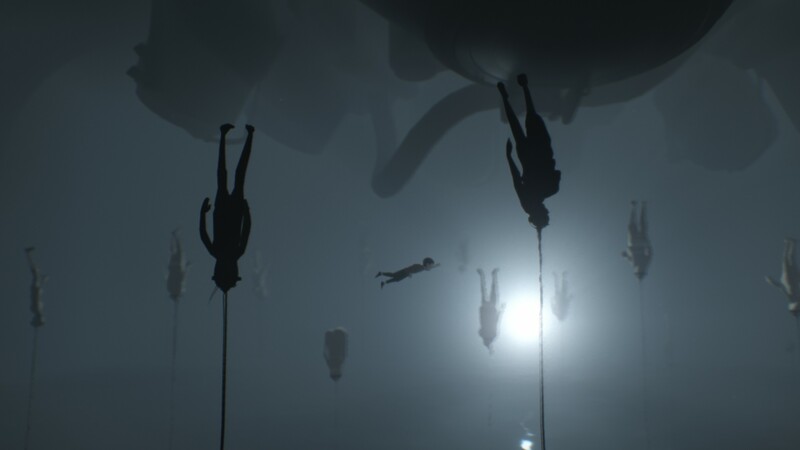 What may come as an unfortunate realization for casual players, Inside has two endings, one of which is locked behind full game completion; to access the “true” ending, players must find and disable 13 orbs, some of which are hidden in outrageously obscure locations. Regardless of the conclusion, both endings leave the player reflecting on their quest; is Inside a journey of discovery, a tale of scientific revenge, or perhaps a reflection of ourselves and our desire to break from the conformity of modern society as shown through Blue Man Group’s The Complex album? With absolutely no dialogue or text presented to the player over the course of the 2-5 hour experience, the purpose of Inside is left up for player interpretation. Inside is a puzzle-platformer that thrives on its eerie setting. Players are given just two actions for the entire game- a jump and a grab. The nameless child can traverse over most obstacles, however others may need some manipulating, as he can knock over select poles and ladders, and move low-lying objects as needed; Inside‘s first obstacle is a wall that can only be scaled after pushing and climbing a refrigerator. Some obstacles simply require the flick of a switch, however physics play a large role in the majority of the game. The child may need to access a section of the environment by knocking something over, or via launching an item into an unreachable area. Various sections of the game require the child to swing back and forth on power cords or ropes, building enough momentum to narrowly clear a gap. Though only accessible for a brief duration of the game, the child can use a submarine pod’s boosters to blast through cracked walls, or up and over some gaps above the water-level. More complex solutions require players to manipulate the environment itself, such as erecting cover from a shockwave, tearing plywood off walls, or in a handful of bizarre cases, manipulating water itself. 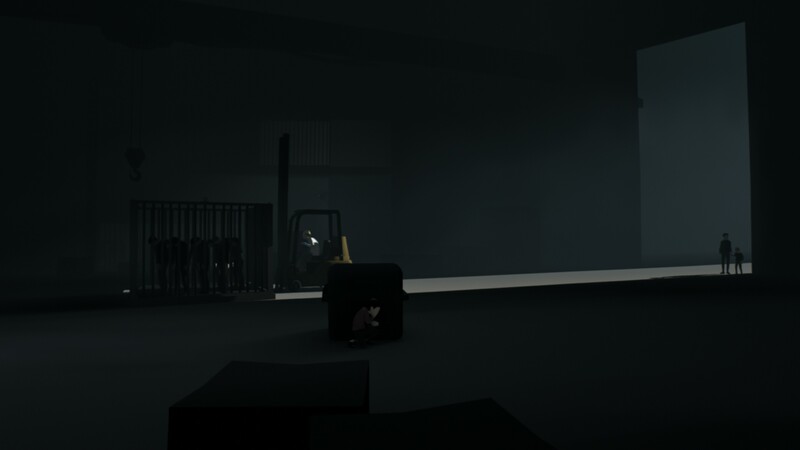 Though the game is primarily focused on solving puzzles, a fair amount of gameplay is dedicated to stealth, as the child can only hide from or outrun enemies. Dogs and hunters can easily be outsmarted by climbing fences, hiding in the shadows or by swimming to safer shores, however Inside hosts more devious foes, including a water-born girl poised to drown the child, and titanic robots capable of spearing visible intruders. 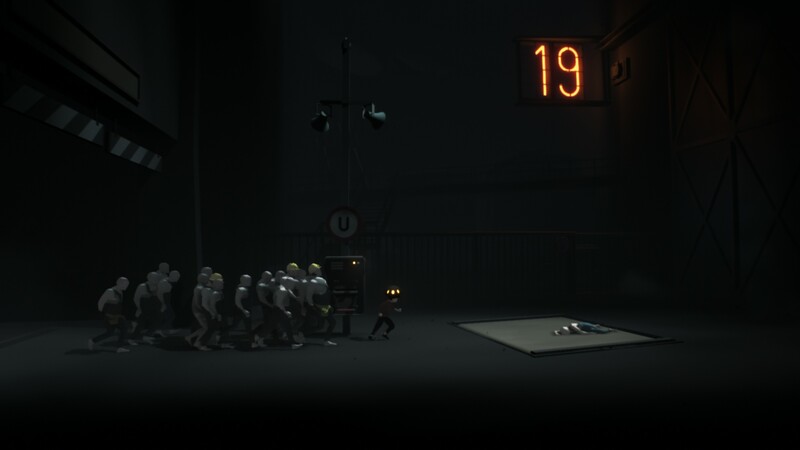 An apparent motif of Inside is the idea of “control”, as noted by the countless humans obeying the orders of robots, and the underlying suggestion that the majority of the game occurs within a titanic laboratory. This idea bleeds over into key gameplay segments where the child gains control over others through the use of a specialized helmet. When the child dons one of many yellow helmets within the facility, the controls are switched to all of the affected individuals. If a large group of people- or presumed test subjects- are mind-controlled, they function as a hive-mind capable of lifting industrial doors, moving heavy objects, or boosting the child to higher locations. 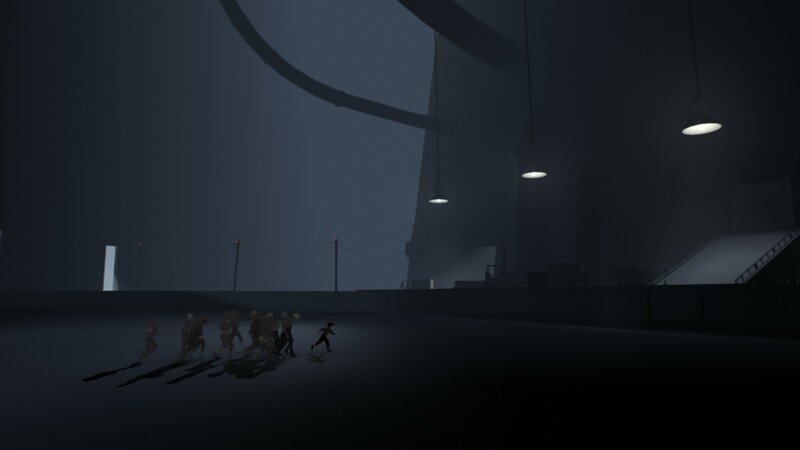 Unlike Playdead’s previous title Limbo, Inside‘s puzzles have a more restrained difficulty curve as the game progresses, offering a constant challenge, albeit never entering the realm of absolute frustration, even in the final moments of the game. The only frustration arises from attempting to find all 13 hidden orbs in one attempt, as previous areas can become inaccessible due to game progression. Though not necessarily a horror title, Inside is certainly an eerie- and at times unsettling- experience. The game is void of color outside of the severely monochromatic industrial setting, with the only accents being the child’s red shirt, the yellow and red glow of some electronic devices, and the occasional inviting rays of light. For being “trapped” in such a large laboratory or research facility, its internal areas have been abandoned; the only life comes from hostile test subjects and other humans. There’s an additional sense of oppression, as some humanoids are locked behind bars, or in satellite prison cells throughout the game. Truly driving in the unnerving nature of Inside‘s world, the characters all have blank faces with no eyes or mouths; the only defining features come from their hairstyles and clothing, with most of the humans wearing business attire, blue-collar uniforms, or the black clothes of the organization pulling the strings. Inside also lacks a consistent soundtrack, however ambient tunes are there to accent puzzle solutions and important gameplay revelations. Playing off its own name, Inside uses ingenious visual trickery to ensure that players keep trekking forward through the title’s vast environment. After a surprisingly long initial loading screen, Inside boots into one extensive environment; there are no levels, just one seamless experience never broken by loading screens, checkpoints or new stages. Inside‘s visuals are lacking in finer details, however the game excels at establishing the scale by pulling the camera out for wide shots, even if the environment lingers into “impossible space” with a land-based structure somehow connected to a ship, mining station, lab and an office building. Gameplay is on a linear 2D plane, however the camera tilts in the direction of travel, placing the destination further into the background. This gives the environment expanded depth, presenting players with the motivation of going “over there”, as opposed to “running towards the right side of the screen”. 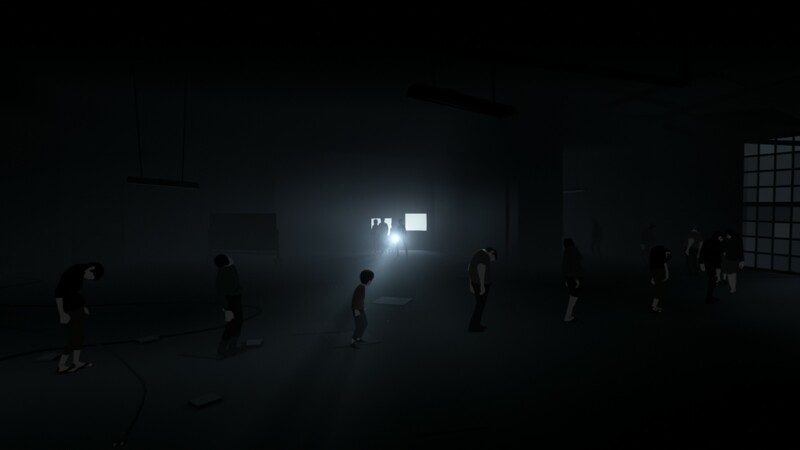 The most effective visual teases lie in several establishing moments where the child is looking ahead into the environment, moments before players explore the area themselves. 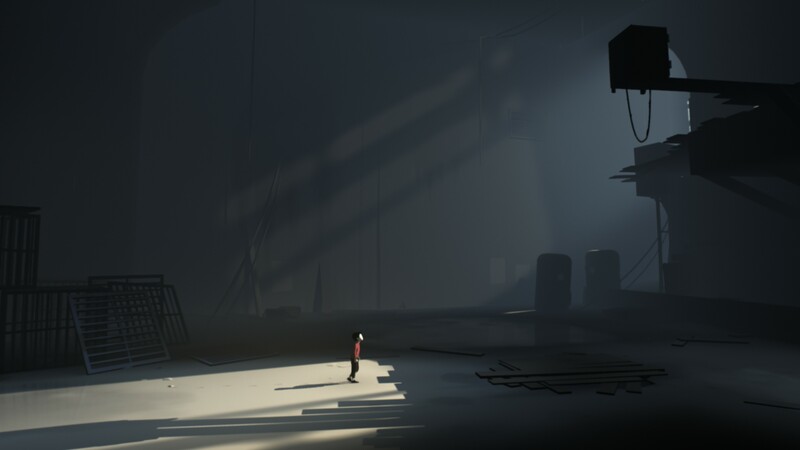 The real hook of Inside lies in the journey through a haunting world, with no compass other than the player’s own curiosity. Both of the open-ended conclusions will leave its audience speculating for weeks, though players who desire closure may be disappointed with the final moments of the game. Regardless, Inside is a memorable gameplay experience sure to please fans of its spiritual predecessor.